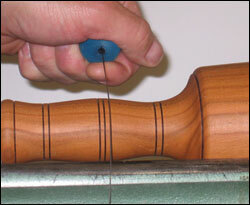 A great way to add detail to turnings is to burn a stripe on the turning with a wire. The rotating wood heats up the wire until it burns an impression into the wood. The K C Wire Burners are made of different sizes wires for burning different width lines on turnings. Each wire has a wooden ball handle on each end to offer a cool comfortable grip on the wire. The balls are color coded to show the size of the wire used. We offer three sets of Wire Burners. Pen Set with three 6" long wires with widths of .016", .020", .026". Spindle Set with three 6" long wires with widths of .016", .026" and .039". Faceplate Set with three 18" long wires with widths of .020", .033" and .045".